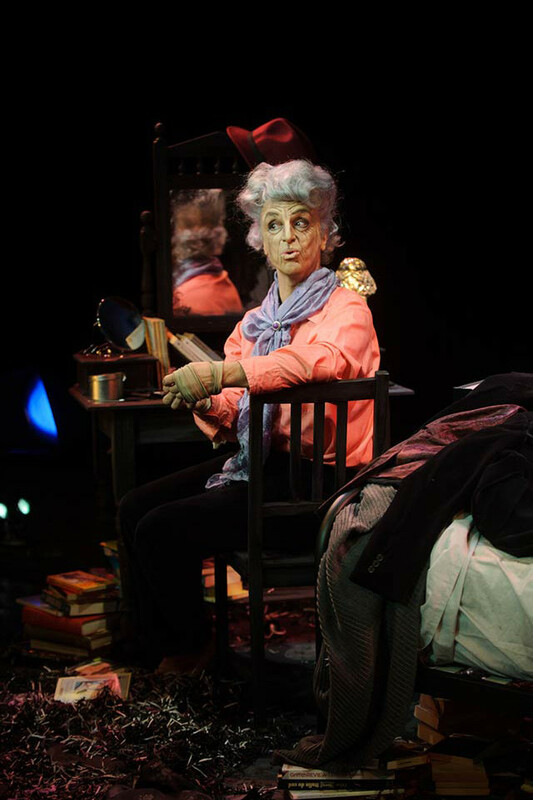 Resident Alien theatre review: On being Quentin Crisp | Daily Review: Film, stage and music reviews, interviews and more. Fiona Blair reviews the return season of Resident Alien starring Paul Capsis as Quentin Crisp and directed by Gary Abrahams. The show was performed in Melbourne at 45downstairs and at the Brisbane Powerhouse earlier this month and will be presented at the Seymour Centre in Sydney June 13-16. Resident Alien, is a curious piece. Not least because of its subject, but more particularly, because of its timing. In March 1999, the British author of the play, Tim Fountain, and the actor who was to play Crisp, Bette Bourne, boarded a plane at Heathrow and flew to the States. They spent a day with their subject in his boarding-house room in New York, and extracted an agreement from him that the work – to be based on material from his published autobiographies and from his one-man shows – go ahead. Though Crisp’s support wavered, the play opened at The Bush Theatre in London, on November the 12th, 1999. On November the 20th, Quentin Crisp himself, returned to perform in the UK for a final tour of his own one-man show. He died the next day, on the eve of the first performance. A PC Sissy arrived to identify the body. While the two elderly camp undertakers who arrived to prepare the recently departed for the final obsequies, went into near paroxysms on realising his identity, and nearly dropped the corpse. Watching Bourne’s impersonation at that time – the performance would have run concurrent to Crisp’s, had he lived – must have been an extraordinary experience. One wonders, had Crisp’s own show gone ahead, which embodiment of the man would have been more convincing. So Resident Alien became a sort of pre-death eulogy. Bourne, actor/activist/drag-queen, himself to become the subject of a theatre piece, 2009’s A Life in Three Acts, toured the play through the United Kingdom and on, to America. In Australia, Paul Capsis, surely ripe for some sort of national treasure status, has made the role his own. ‘I try to become more like myself every day,’ he said. ‘I endeavoured, for the film, to become more like him than himself,’ said John Hurt. But this is where the current iteration of the man needs clarification. The piece isn’t quite sure whether we’re here for another Evening with Quentin Crisp, who happens, now, to be dead; or for a sort of pre-wake, held by the soon-to-be-departed on behalf of himself. Fountain has said he borrowed, in part, the structure of the play from Waiting for Godot. But wait-ing for Mr Black and Mr Brown (surely, given the vicissitudes faced by Mr Crisp, they should be Messrs Black and White) is too obviously a device. And besides, I think he’s missed his Beckett; if anything, the performance is reminiscent of that author’s Footfalls, and maybe that’s who we’re waiting for, Death. The set (Romanie Harper) is Crisp’s New York room, celebrated – as had been his previous lodgings in the UK – despite its occupant having amassed over a million dollars during his lifetime, for its filth. Housework, believed Crisp, was a waste of time: ‘after the first four years, the dirt doesn’t get any worse.’ The grease on the other hand, as his pillow attests, deepens. We see him cocooned in bed. Then huddled under the sheets; lit by, embracing, his tiny, portable, flickering TV. When he wakes to our presence, he displays a flustered self-possession, a slightly defensive hauteur. He dons a dressing-gown of doubtful lineage, over filthy bandages, wrapped about his limbs against the ooze and excess of eczema, and a filthy truss to hold in his hernia. His wispy, grey-white wig is ruffled, discomposed by sleep. The mannerisms of his speech are accurate, though the light, precise tone is gravelled over with by time. He’s not in good health, a bit unsteady on his feet: the wavering of old age. He looks to be a cross between Miss Havisham and an aging Marlene Dietrich. Later in the evening, cooking up potato peelings in a frypan; the proximity of precariously balanced gas stovetop, palsied grip, and floaty-flirty dressing-gown, suggest that Miss Havisham’s final flaming may be at hand. The outlines are sketched, but his face is not completely ‘on’. He will apply his make-up contemplatively, becoming more recognisable to himself as he works. 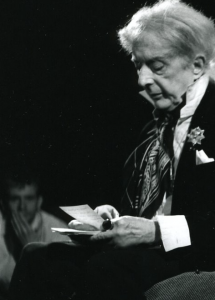 At this bedside, in the room that holds his entire life, Quentin Crisp holds audience. Biopics rarely work. Nor Bioplays. Hoping for interpretation rather than re-enactment, we of the audience – if we’re familiar with the subject – spend half the time comparing the look, the performance, with our own partly submerged, inaccurate memories (memories already curated for us by myth and by media, since it’s unlikely we actually knew the person), and the other half wishing the theatre-makers could find a way of telling the story, that was more than just a recounting of events. It’s a triumph, more often than not, of the makeup artists’ craft. In the case of Quentin Crisp, the task is further complicated by the fact that the man was already an invention: a creature of his own creation. Though the transformation from Denis Pratt, to Quentin Crisp – a seemingly complete metamorphosis by the 1930s – was, in fact, an ongoing quest. He was rent-boy, engineer’s tracer or technical drawer, and artists’ model. He published forgettable works on window-dressing and calligraphy. He dyed his hair a vibrant red (’On the day that War was declared, I went out and bought two pounds of henna’) and at all times, in public, appeared in full make-up. Perhaps we all ‘prepare a face to meet the faces that [we] meet’, but for Crisp, the act was deliberate; the mask, a daily ritual. In 1964, Quentin Crisp gave a radio interview about his chequered life to Phillip O’Connor, whom he knew from the Black Cat cafe in Soho, for the BBC’s Third Programme. In 1971 he took part in a TV documentary and, finally, in 1975, the filmed version of his autobiography, The Naked Civil Servant, was broadcast on ITV. Now this was in the long-ago days, Before Cable, when there was a curious egalitarianism about TV viewing, particularly noteworthy in a class-based society like Britain’s. If what was screened over dinner was dross – and much of it was – at least we all ate the same meal. And so this story about an unabashed, not-to-say, defiant, queer, made it’s way into the sitting-rooms of Great Britain, thence other nations of the Commonwealth and finally, the USA. John Hurt, ’my official representative here on earth’, a revelation as Quentin Crisp, was lauded. “Well, I’m told that the constitution allows residency for unique people who can fulfil a function that no-one else can possibly perform, and I humbly suggest that I qualify on those grounds”; and the betrayal many felt at his lack of enthusiasm, or support, for the Gay Rights Movement. ‘I represent nothing more than my puny self,’ he insisted. He was Edwardian, he was bohemian, he was conservative, he was radical. “Become the public persona! Erase the private one!”, he advocated. Acting is always a process of ‘becoming’, of inhabiting. But what does Paul Capsis as Crisp, see, when he looks on stage, into the mirror? A paler shadow of an imagined self perhaps? Capsis overlaid by Crisp? Crisp overlaid by Capsis? The mask behind the mask? 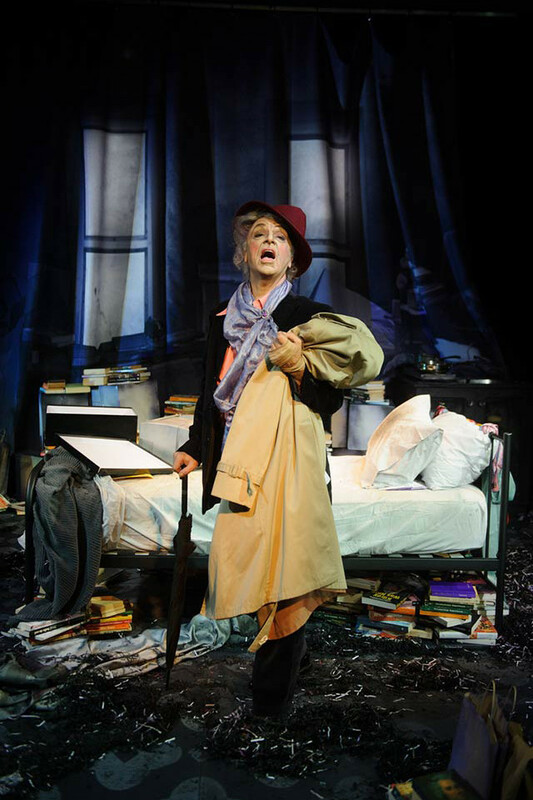 Because Quentin Crisp so consciously created himself, this isn’t quite like looking at an actor portraying a person. It’s more like an actor re-animating a persona. A kind of necromancy. But the resulting performance seems too forensic in its recreation of the dead man, too fixed on externals. Capsis claws at the skin at his throat, repeatedly drags his tongue around his mouth and teeth. It reads as a reproduction of the mannerisms of a generic elderly person, rather than Crisp in particular. It’s as though we’re watching an odd experiment in heightened acting for a silent movie. It’s a choice, I guess, but the palette is limited. The performance I witnessed, seemed to lack focus – words were fluffed, props fumbled – the sort of things that an on-fire Crisp-Capsis would have delighted in, would have used, and exploited, with aplomb. And there are lines you want him to linger over. Moments you want him to hold. Glib witticisms that now, in his nineties, he might reflect upon differently. The play itself is slight, and would benefit from a thorough re-working rather than just a re-staging. After all, nearly twenty years have passed since Crisp’s death – his final volume of autobiography was published just last year – and the complexity, the inconsistency of some of his attitudes, which owe much to the times he grew up in, requires a deeper examination than the piece allows. ‘To create a hysteria around this illness now, would play into the hands of your enemies. They would say that homosexuality and disease go hand in hand. We must treat this crisis as a boring triviality. It will pass.’ Maybe. ‘Did you ever hit back [at your persecutors]?’asked the host of the 8 o’clock show, the night after The Naked Civil Servant was screened. I grew up in rural Victoria, John Hurt as Quentin Crisp gave the first portrayal of a homosexual person I ever saw that wasn’t designed to generate either disgust or mockery. I’ve re-encountered kids I grew up with who never dared when we were young to acknowledge their homosexuality. It’s not enough to hope those days are gone. Deify or demonise him, for all the flamboyance, the bravado, there was a learned cautiousness to Crisp, a guarded quality: his survival depended on his ability to push the boundaries just so far, he needed the protection of a perfect façade, Resident Alien has no such excuse. Gradually increase the pace to five miles an hour. Do not stop until forcibly stopped. Stand still and look at him.